Great pricing! The bright red lit popcorn cabinet will keep'em coming back for more. 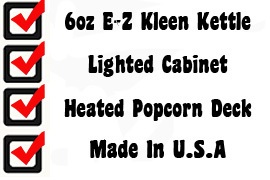 Gold Medals 60 Special Popcorn MachineThe industry's original Deluxe 6 oz kettle popcorn popper. Silver top and bottom frame, bright aluminum finish, tempered glass, with EZ Kleen kettle. Heavy-duty reinforced top dome and side vents allow for displays on top.